Choosing the right furnace to heat your home is one of the most important decisions you’ll make and has a dramatic impact on your year–round comfort. All furnaces are different, so it’s important to consider quality and energy efficiency when considering a new system. You’ll want to know what to expect both in monthly energy costs and service costs over the life of your system, as well as how many years the furnace is designed to last before needing to be replaced. To take some of the guess work out, Millie’s Heating & Air Conditioning offers our customers Amana brand furnaces, among the most reliable and energy efficient furnaces currently available. In addition to reliability and energy savings considerations, our Arlington, Virginia area furnace specialists highly recommend Amana furnaces because they among they’ve got a proven track record of performance dating back to 1934. If your furnace is on its last legs and you’re looking for one you can depend on all winter long and for years to come, call us today to discuss your options. 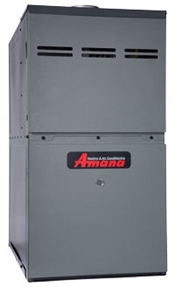 We’re certain that we carry an Amana furnace that will meet both your needs and your budget. This gas furnace is covered by what we believe to be the best warranties in the indoor home comfort industry. 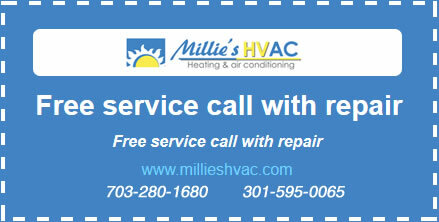 If the heat exchanger ever fails to the original, registered, homeowner we will provide a new furnace. This furnace also has a 10–Year Parts Limited Warranty* on all functional parts. For a full description of all warranties applicable to this product, please click on the consumer brochure or product warranty links above. If you want to consider the best 80% AFUE gas furnace that the Amana brand offers but don’t need the efficiency provided by a 90% furnace, install this furnace and enjoy the energy and money savings year after year. This gas furnace has an AFUE rating of 80% which means that 80 cents of every $1.00 of heating energy expense warms your home.